14 "Meltdown and Recovery in Detroit"
19 "United States of ALEC"
John Nichols is Madison Wisconsin based "progressive" journalist. Nichols is former national correspondent for newspapers in Toledo and Pittsburgh. He holds a master's in journalism from Columbia University. Democratic Socialists of America kicked off events at the Democratic National Convention by organizing a major panel on the 2000 presidential and congressional elections. National Director Horace Small played host to DSA leaders Harold Meyerson, of LA Weekly, who was doing double duty putting out a daily for conventioneers, Barbara Ehrenreich, who has been stumping for Ralph Nader, Cornel West, who was a co-chair of the Bill Bradley primary campaign, and DSA youth organizer Daraka Larimore-Hall. They were joined by panelists Maria Elena Durazo, president of H.E.R.E in LA, John Nichols of the Madison daily Capital Times, Antonio Villa, Speaker Emeritus of Californias Assembly, and William Monroe Campbell, of Ministers Against Global Injustice. John Nichols, political editor of The Nation magazine, and Loraine Ballard- Morrill, news and public affairs director of Philadelphia radio station Power 99 FM, were featured speakers at a media workshop held in conjunction with the Democratic Socialists of America 2001 National Convention. Nichols and Ballard-Morrill, along with fellow presenter George McCollough, station manager of DUTV in Philadelphia, discussed with the audience various ways of having an impact on media in an age of media concentration and decreasing attention to local news. Josh Silver is the executive director of Free Press, a national, nonpartisan organization that he co-founded with Robert McChesney and John Nichols in 2002 to "engage citizens in media policy debates and create a more democratic and diverse media system". He has published extensively on media policy, campaign finance and other public policy issues. The Chicago Democratic Socialists of America 48th Annual Eugene V. Debs - Norman Thomas - Michael Harrington Dinner was held on Friday evening, April 28, 2008 at the Holiday Inn Mart Plaza, just across the Chicago River from the Loop. It was held on the eve of a major anti-war demonstration in New York City that drew some 350,000 participants. A few days later, on May 1st, there were demonstrations across the nation in support of immigrant rights. The march and rally in Chicago was estimated to have drawn nearly a half-million participants. The featured speaker was John Nichols, a radical journalist whose work appeared regularly in The Nation and Wisconsin's Capitol Times. John Nichols of The Nation, will speak to the need to go beyond taking back our country, beyond things just not getting worse, and the need for a progressive agenda. 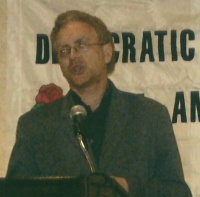 John Nichols, The Nation magazine writer, who covers electoral issues, addressed the Committees of Correspondence for Democracy and Socialism 5th National Convention and Symposium July 20 - 23 2006 in Chicago Panel 3: Strategies for Winning at the Polls in 2006 and 2008. John Nichols has been a guest speaker at Wisconsin's annual progressive Fighting Bob Fest, in 2002, 2006, 2007, 2009, 2011, 2012. 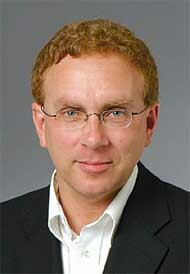 In 2009 John Nichols was listed as Washington correspondent of The Nation. As of 2009 John Nichols was a Contributing Editor of Chicago based socialist journal In These Times. Nichols has been a frequent contributor to the liberal magazine, The Progressive. "Meltdown and Recovery in Detroit"
Keynote Speaker John Nichols Washington Correspondent The Nation. An event MEDIA & THE WISCONSIN LABOR STRUGGLE, was held Thursday, March 3, 2011, 7:00PM Orpheum Theatre, 216 State Street, Madison. John Nichols - journalist, author and Wisconsin native - speaks to the Wisconsin Alliance for Retired Americans, about media and media relations March 21, 2011. A public event sponsored by Democratic Socialists of America, "Equality and Jobs for the 99%:Economic Justice for All", was held November 11, 2011; 7:00 p.m. at St. Stephen and Incarnation Church, 1525 Newton NW, Washington, D.C.
DSA, the principal U.S. affiliate of the Socialist International, is the largest socialist political organization in the country, with more than 6,000 members and active locals in more 40 U.S. cities and college campuses. DSA Locals in New York, Boston, Philadelphia, Chicago, and Wichita, among others, have taken an active role in the Occupy Wall Street, Occupy Freedom Plaza, and other Occupy protests in support of jobs and economic justice. This meeting was organized in conjunction with the 15th National Convention of Democratic Socialists of America, which is being held at the Sheraton Premiere at Tysons Corner November 11-13, 2011. Over 180 people attended the thirteenth annual Frederick Douglass-Eugene V. Debs Dinner at UAW Local 600 in Dearborn on November 10th. Honorees were Steve Babson/People Before Banks Coalition and Marjorie Mitchell, the Executive Director of the Michigan Universal Health Care Access Network. The highlight of the evening was John Nichols’ keynote speech. The theme of his speech was that socialism is not a bizarre European ideology, incompatible with the American experience. Rather, socialism has been an intrinsic part of American politics since the founding of the nation. The "Advisory Group" consistied of Greg Albo, Laura Flanders, Bill Fletcher, Jr., Rachel LaForest, Sarah Leonard, John Nichols, Frances Fox Piven, Bhaskar Sunkara, Maria Svart, Sean Sweeney, Bill Tabb, and Steve Williams. Fighting Bob Fest speakers 2018: Jim Hightower, Randy Bryce, Mandela Barnes, John Nichols, Rep. Chris Taylor, Sarah Godlewski, Christine Neumann-Ortiz, Ruth Conniff, Will Durst, Karin Wolf, Kim Wright, Paula Bezark, Lauren Peterson, Raging Grannies, Danny Chicago, Norman Stockwell.